Prenton Golf Club has submitted plans to its local council, according to Wirral Globe. The plans include new academy coaching facilities and 22 ‘executive-style’ homes facing the course’s signature hole. The site currently comprises the existing clubhouse and car park. Part of the course will be remodelled with the planned clubhouse in a new location that will maximise views over the golf course. Gareth Irwin, general manager of Prenton Golf Club, said: “This is a very exciting time for us, shaping a future that builds on our long-established golf club. 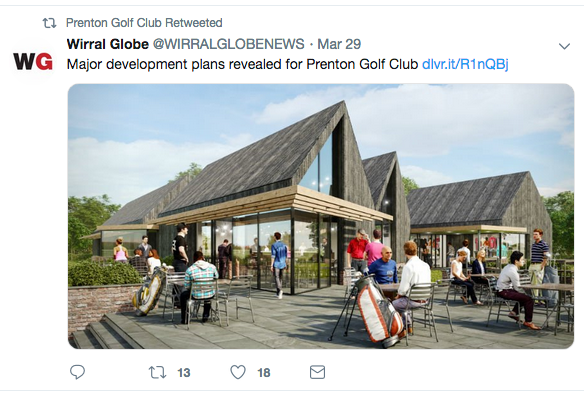 “This is an opportunity to bring improvements to the golf experience here at Prenton that will enhance the reputation of the club and attract more members and visitors, thus ensuring the long-term financial sustainability of the business. Spokeswoman Amy Rainsford said: “The existing clubhouse building is ageing and deteriorating with limited views of the playing course. Architect Graham Bell added: “The masterplan has been designed to enhance the golfing experience for members and visitors with new academy coaching facilities.